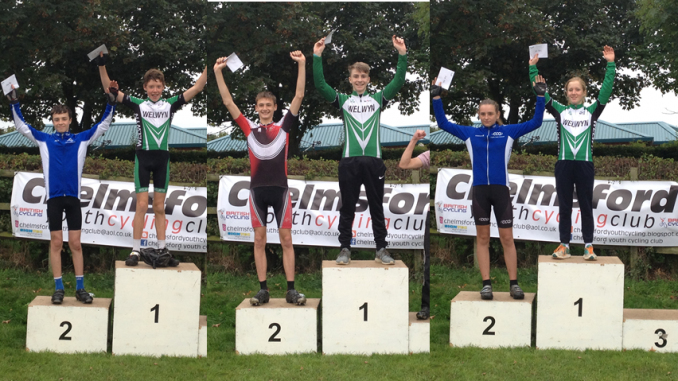 On Saturday the club hosted the Cycling Time Trials GHS Final at Wodson Park, Ware over a 10 mile course on the A10. Almost 200 riders had qualified for the final via heats run over the whole country and this included nine Wheelers youth riders. The first rider was due to start at 9-01 but the start had to be delayed by over 2 hours due to a lorry breakdown on a critical position on the course. Best of the Wheelers riders was Michael Parry in 22-15 for 22nd place followed by Will Raymond in 22-33 for 28th place. The Wheelers trio of Michael Parry,Will Raymond and Toby Miles broke the Wheelers Youth team record with 1-08-57 by around 4 minutes which was set in 2002 by Andy Fenn, Peter Bissell and Ed Checkley.